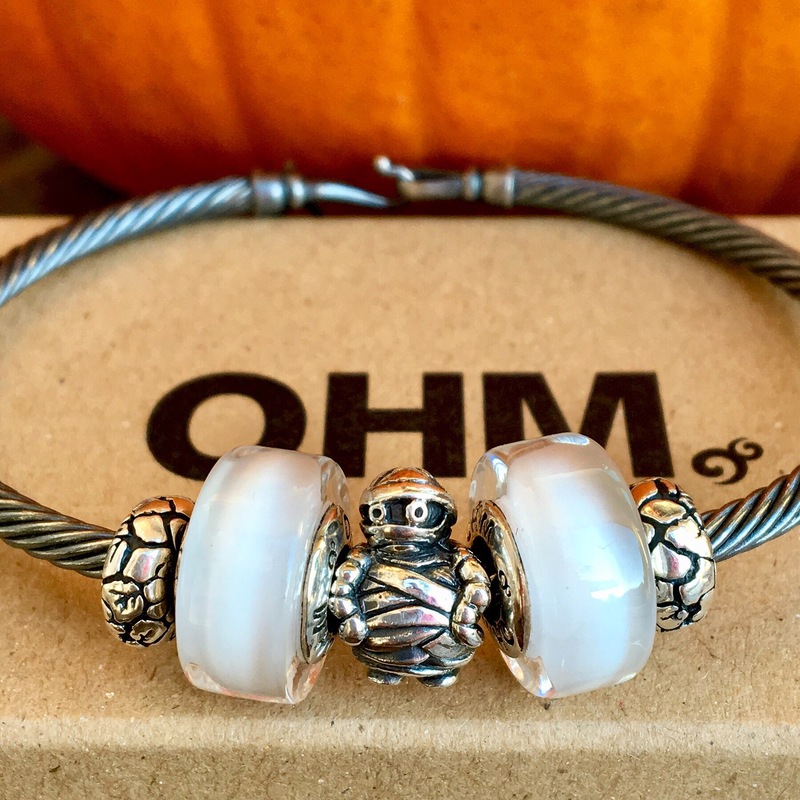 Last week was a feature on Hallowe’en themed Trollbeads and now it’s time for Ohm Beads. 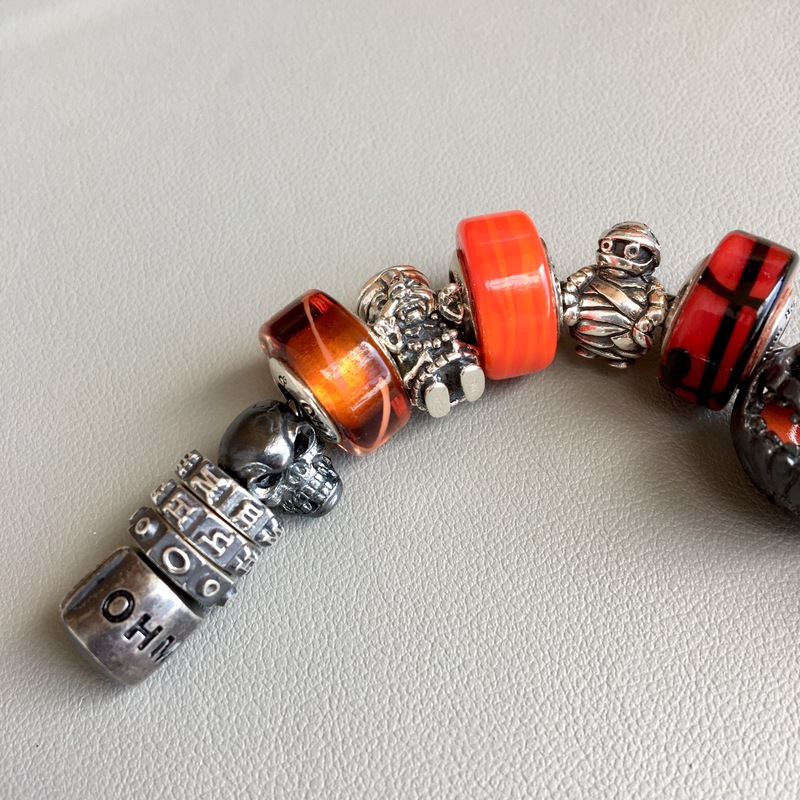 There are lots of regular Ohm Beads that work especially well at Hallowe’en, but this year sees the release of several that are particularly thematic. 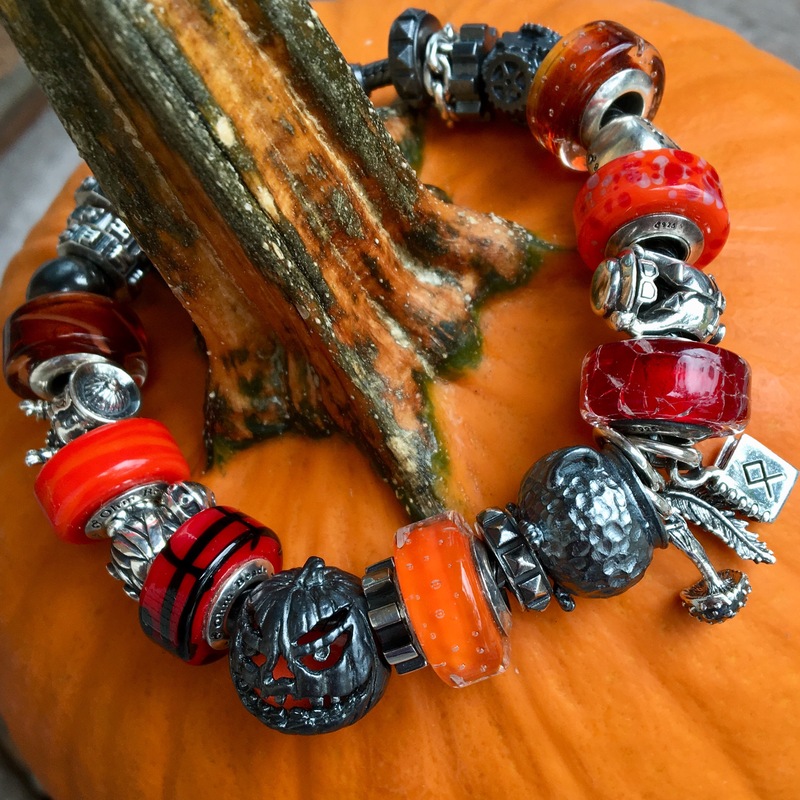 Some of the new beads are Invisible Man ($45 USD), Mummy ($45 USD), Trick or Treat ($95 USD), Dirty Magic ($65 USD), Mech Tech 2E ($30 USD), Chained 2E ($30 USD), Hot Topic ($30 USD), Magic ($30 USD), Shroom ($30 USD) and Quill ($30 USD). I did a poll on Instagram asking who was cuter, Mummy or Invisible Man. Mummy won by a landslide so it gets to be the first picture, ha ha! I love the eyes on it. 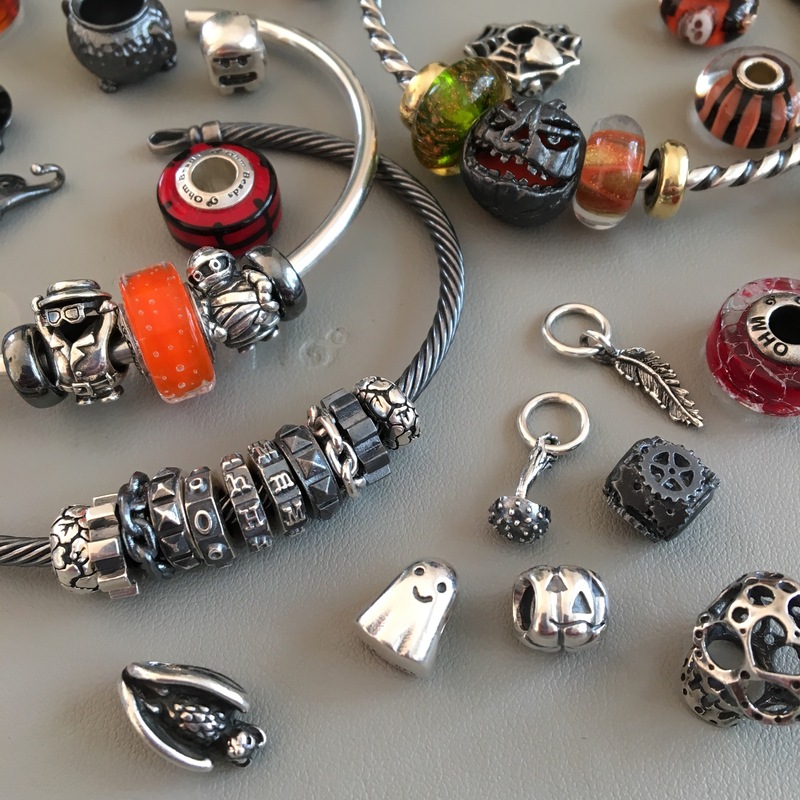 It’s worth noting that these will all fit on Pandora bracelets, if you’re a Pandora person longing for a Hallowe’en bead or two. 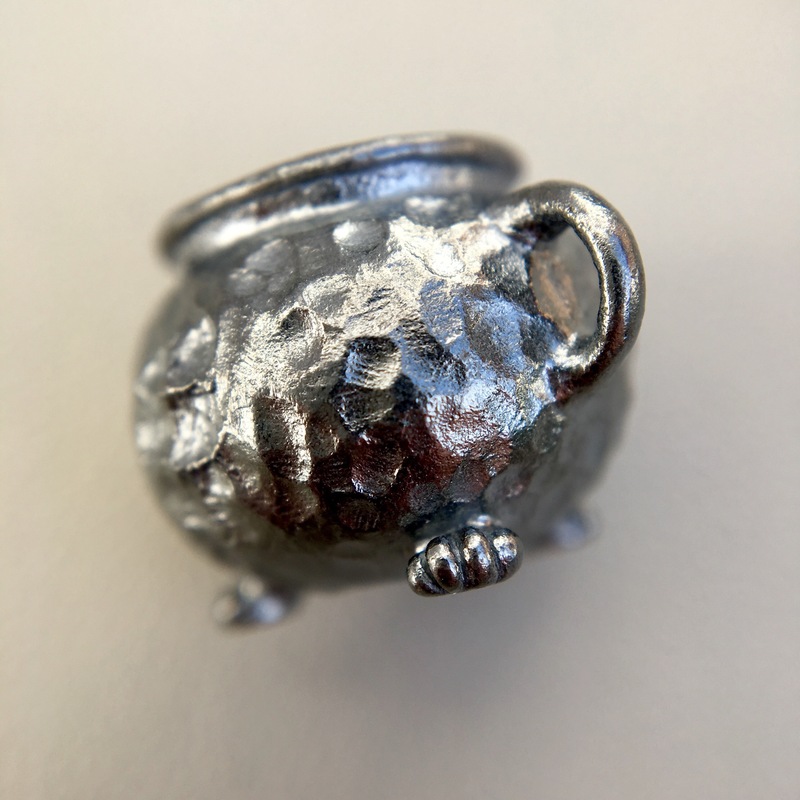 Silver beads like this are so versatile and this little guy would go with any bracelet. Here I’ve used a couple of Cold Milk beads. Check out the detail on Invisible Man. 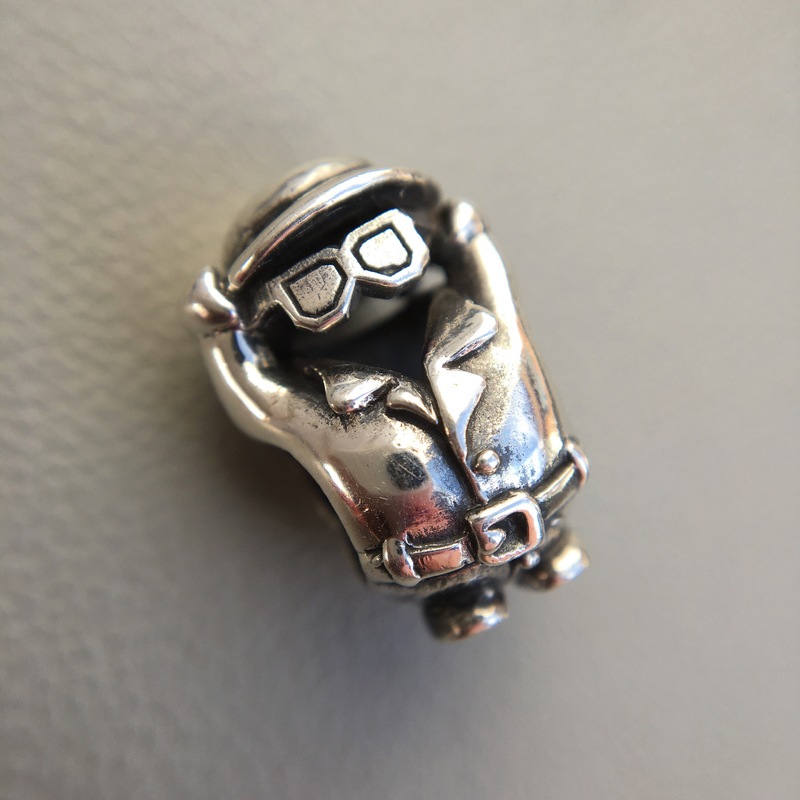 This is the bead that really caught my eye when the previews came out. The trench coat, glasses and hat are so delightful. In this photo below, I believe Sock Monster and Mummy were arguing who would get to eat the cake pop and while that was going on, Invisible Man just snuck over and ate it! Another favourite bead of mine from this release is the cauldron, called Black Magic. Look at the feet on it! It is cored vertically so works really well on a necklace. This poor frog (Redbalifrog) is trying to not be boiled! Now for a couple of close ups of the Quill and Magic. The details of the spine and pages of the book are incredible, especially considering the size! 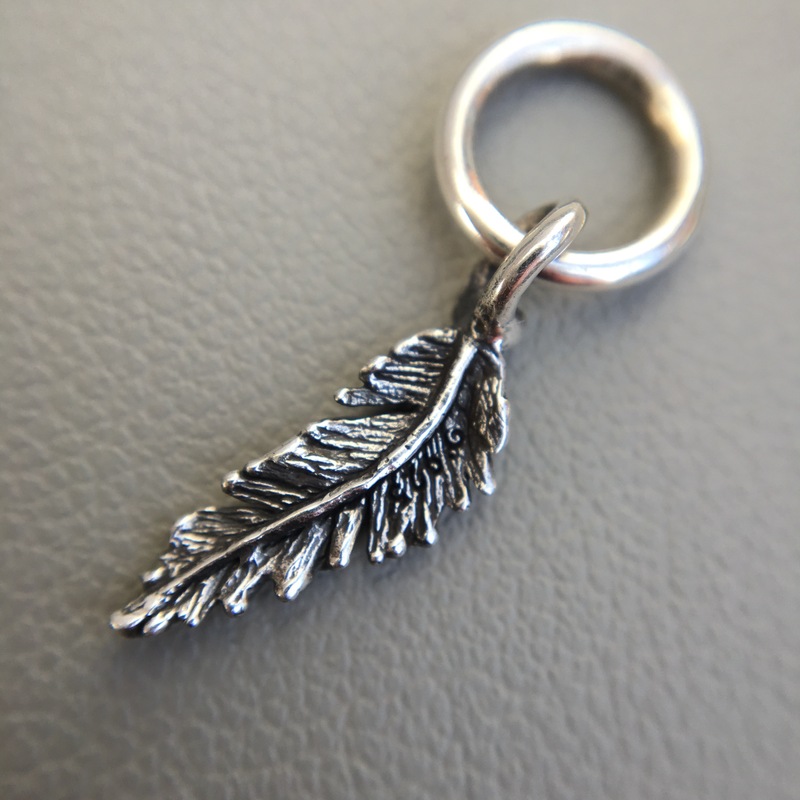 If you buy the cauldron, Black Magic, it comes in a blind bag with a random dangle. I got Magic, but already had one, so gave one to Trisha. The new spacers are shiny versions of the spacers from the Dark Shadows Collection. In this bangle below, I’ve used the three I have plus the original three along with three Typos to spell Ohm. I think the bangle looks better (ie., a more accurate representation of the shininess) in this photo of the mess I made on Saturday. 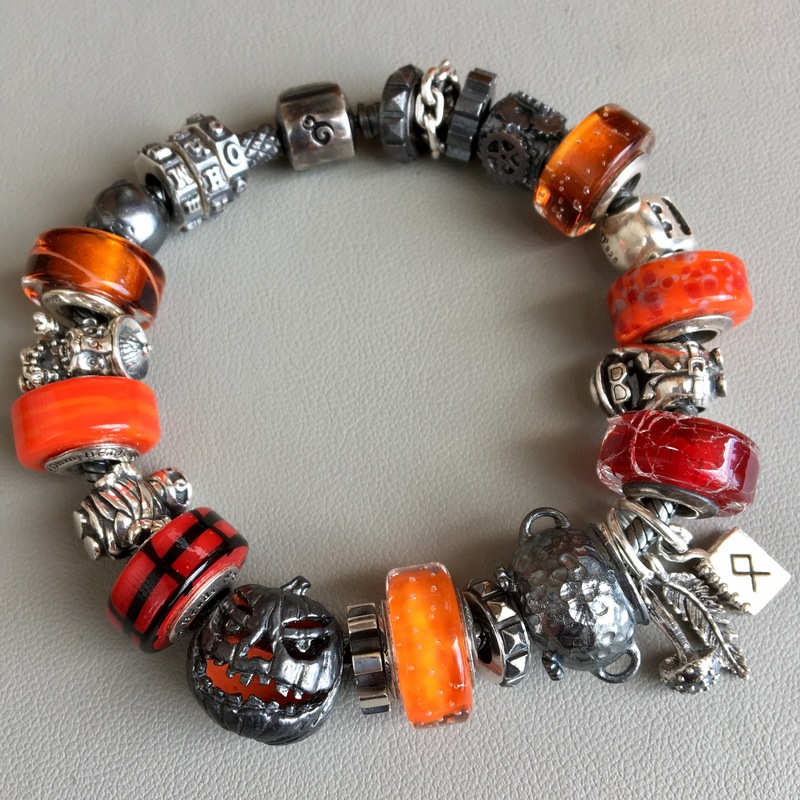 The Trick or Treat bead is the BOTM (Bead of the Month) for October and I was really lucky to get this dirty version. 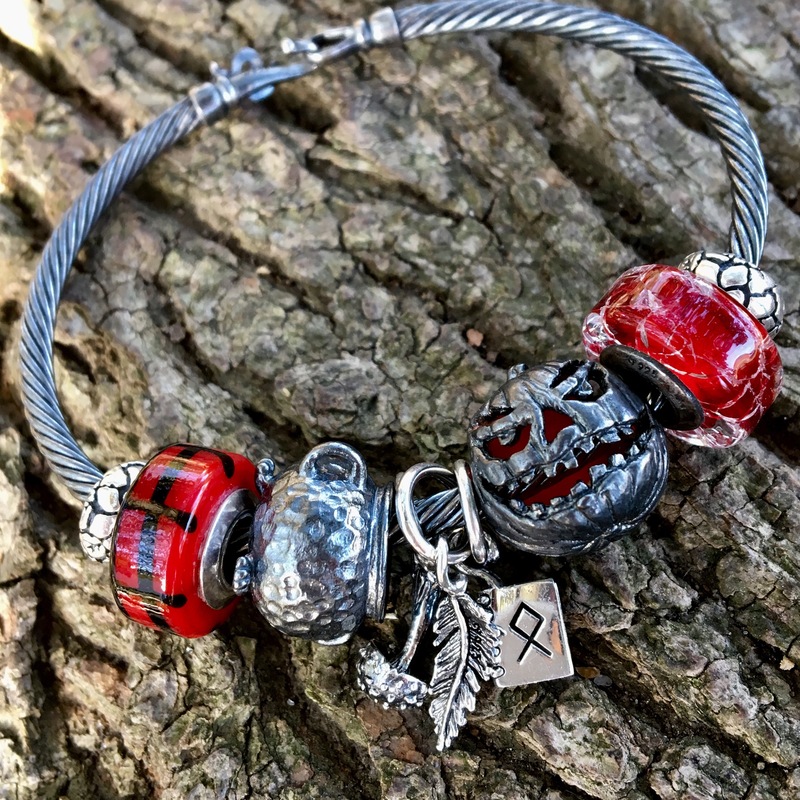 The glass beads below are Tartan Gore and Broken Heart. There is orange enamel inside which looks striking against the pumpkin. I’m pretty sure it’s sold out, so I feel badly even showing it, but here it is. 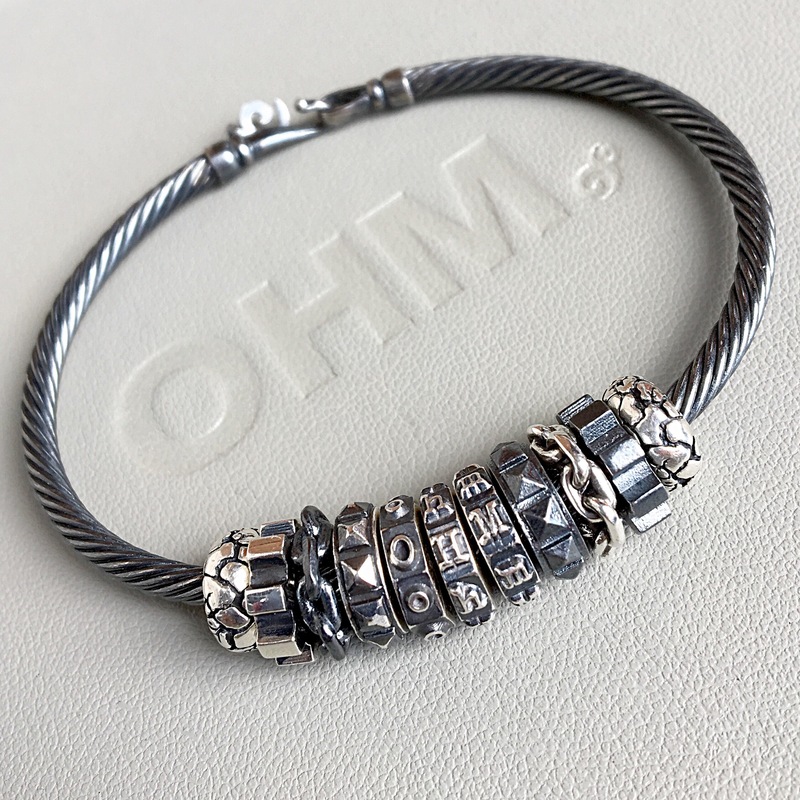 Here’s a better look at the whole bracelet. I’ve really become a fan of beads with the dirty finish. 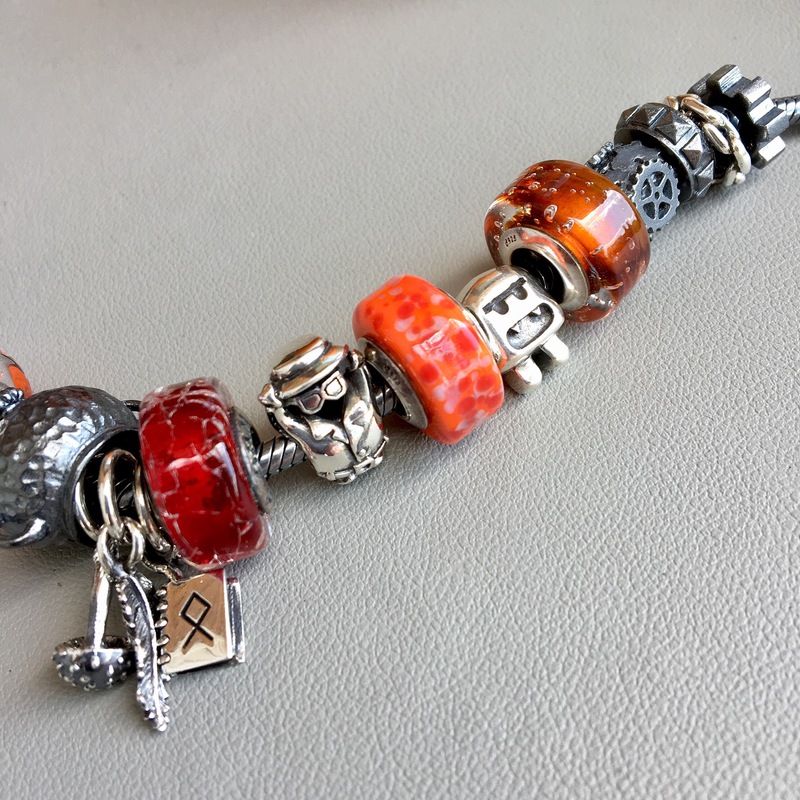 I like how they contrast with silver beads or brightly coloured glass like the orange ones below. Below left to right are three Typos, Cranium 3E, Mulled Cider, Jiangshi, Gangles, Mummy and Tartan Gore. Below left to right after Tartan Gore are Trick or Treat, Mech Tech 2E, Live Your Fantasy, Hot Topic 2E and Black Magic. Below left to right are Shroom, Quill, Magic, Broken Heart, Invisible Man, In the Koi Pond, Sock Monster, Bar Brawl, Widget 3E, Hot Topic, Chained 2E and Mech Tech. So, this was a lot of beads at once and I’m still trying to decide which are my favourites. The Invisible Man and Mummy are real stand outs for me because of the cute factor. 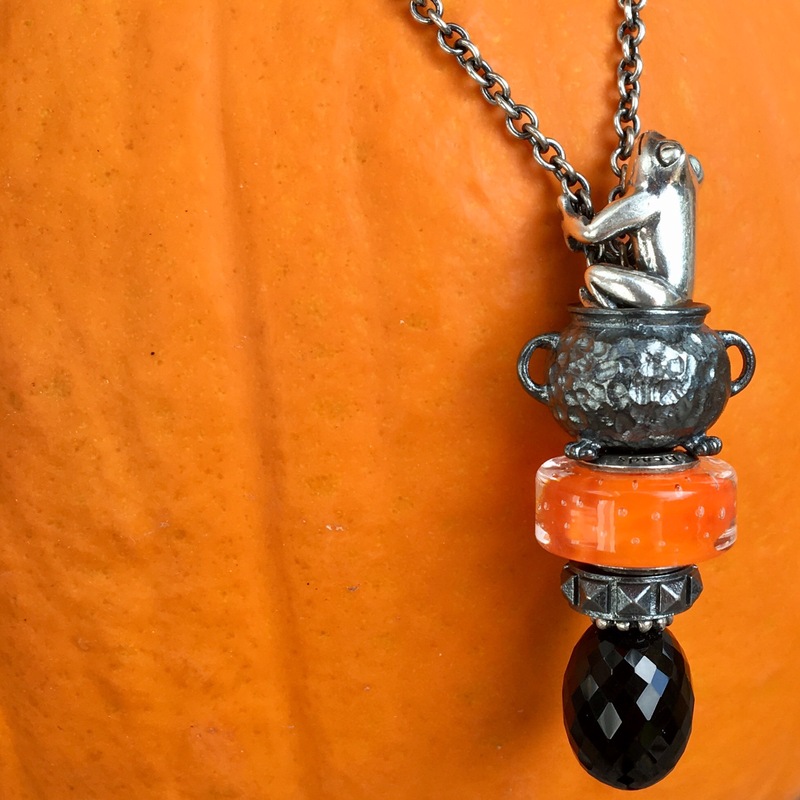 The Black Magic bead I just love on a necklace. I won’t wear it at work with the frog being boiled though! 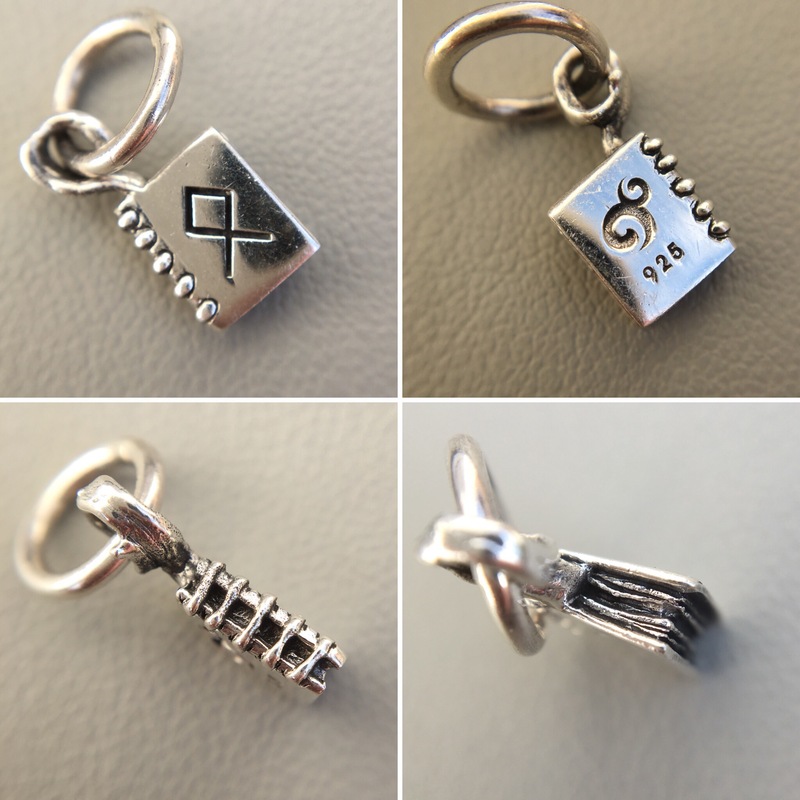 😱 The dangles are beautifully made and I always like spacers as they add a little something to a bracelet. Any stand outs for you with this release? Hi Martha I love everything here! I wish I had a “mess” like yours!!! Hi Suzanne! Yes, it’s definitely fun to make a ‘mess’. I don’t own any Hallowe’en beads, but I own them vicariously through yours for that past few years since I first started following you on IG. 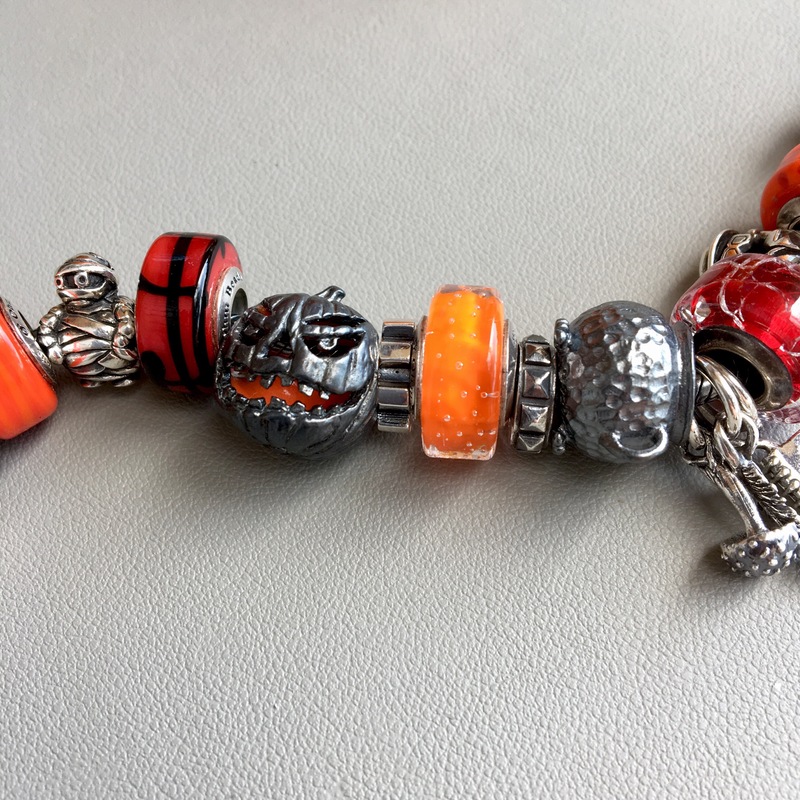 Your themed beads for each occasion during the year is awesome. I think Black Magic, Mr Invisible And Trick or Treat are outstanding creations! Great bracelet! I think that it certainly was a strong release in terms of having things to appeal to a broad audience. I’m currently waiting for my mandrake to arrive 🙂 Hopefully it is speedy! Good point about it appealing to a broad audience, Tracy. I’m not big on the gore but love the cute and certainly the Mummy and Invisible Man are that! I hope your mandrake arrives quickly! 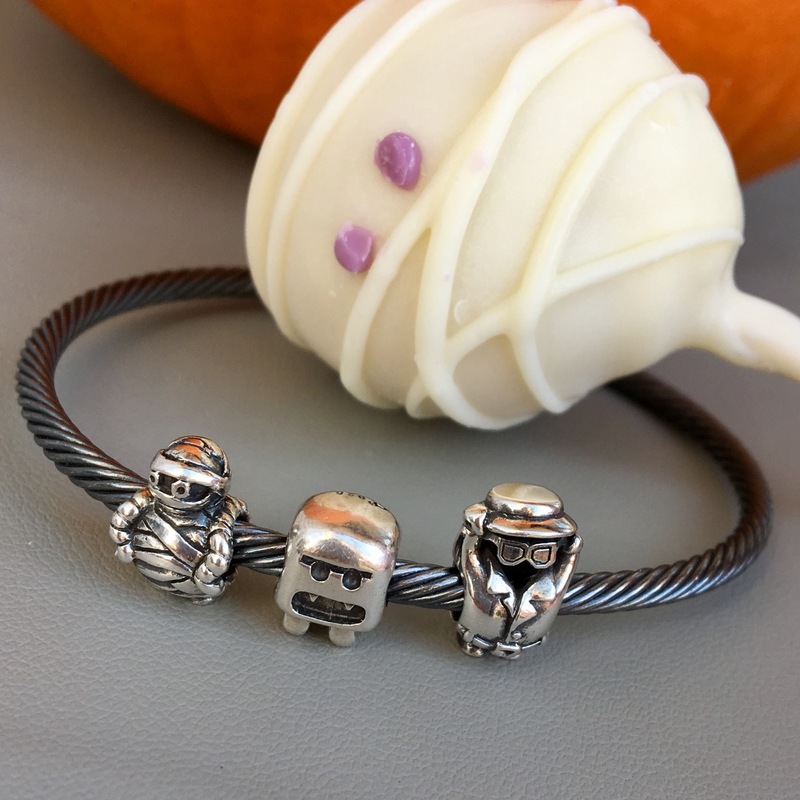 Love your escaping frog necklace and the mummy with cold milk combinations!